Liam, Jack, David, and Val Kelleher, Donoughmore, who were the winners in the Male Calf Class at Kanturk Mart Hereford Promotion, pictured with Joe Noonan (Vice Chairman Kanturk Mart), Liam Philpott (Hereford Society), John Ludgate and Neily Moylan. Champion bull calf pictured below at the Hereford Calf Promotion in Corrin Mart, which sold for €265 with Michael Morrisson, Ted Sullivan & Pat McCarthy, Hereford Society, owner Matthew Hurley, Youghal & Billy Lane, Hereford Society. 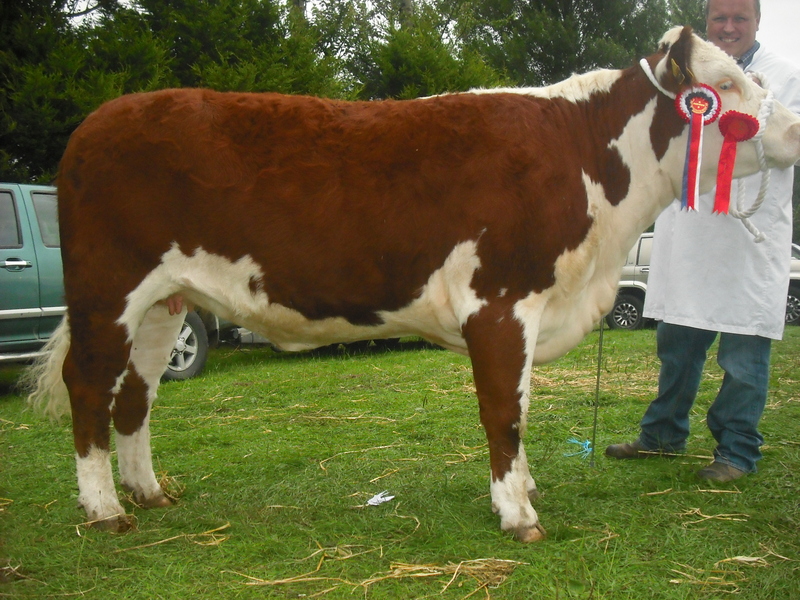 Champion heifer cald pictured above at the Hereford Calf Promotion in Corrin Mart, which sold for €245 with buyer David Meade, Nohoval, Pat McCarthy, Hereford Council, owner Tony Beecher, Ballyhooly & Billy Lane, Hereford Society. The Munster Hereford Branch completed their tour of North Leinster at Oldcastle show on Sunday 20th July following on from herd visits at the Keenagh, Creagh, Portanob, Carrick and Ardnagross herds the previous day. The judge for the event was Mr Robert Shannon. He chose the 22 month old Knockmountagh Sweet Pea as his Champion. Sweet Pea is sired by Dovea AI sire Kilsunny Goliath and out of Knockmountagh Carmel and is owned by Eamon and John McKiernan Monasterboice Co. Louth. Following on from her recent success at Fingal show Christine Drumm’s Kilsunny Doreen’s Ivy was awarded the Reserve Championship, much to the delight of her breeders, the Dudley family who were touring with the Munster group. Eamon and John McKiernan also enjoyed further success by winning the bull or heifer calf born on or after 1st September 2013 class with Knockmountagh Master, a half-brother to the day’s champion and sired by Grianan Firecracker. Brian Clarke, Seamus O’Neill, Philip Smyth together with Hugh & Sarah Murray also featured in the prize-winners at the well-attended event.